This soldering guide explains how to build a DIN module based on the old layout (e.g. from Mike). If you want to build a module based on the revised layout from SmashTV please continue at this page. Start with soldering the 10 bridges which save you from creating a 2-layer board. You can use the cutted legs of caps and resistors, before you throw them away after you finished all the modules! :-) Note that the 4 bridges between Pin 15 of the ICs and Vss (ground) will be soldered at the bottom side! This pictures shows the 4 additional bridges, realized with isolated cables. Stuff the other components: IC-sockets, Resistors, Connectors, ICs. 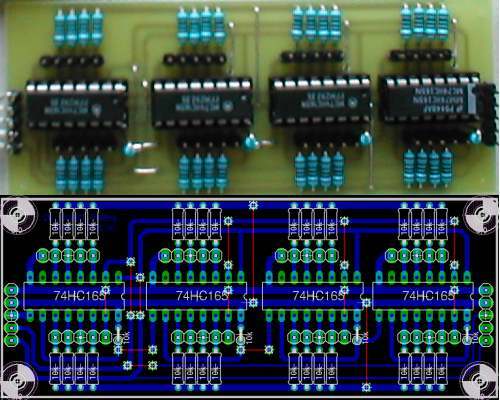 Add also the four additional Bypass Caps between Vdd and ground (Vss) of each chip on the bottom side of the PCB as close to the +5V power input of the 74HC165 as possible. They improve the power integrity. 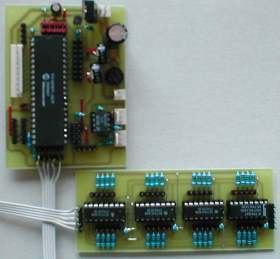 A DINX4 module within a MIDIbox64.